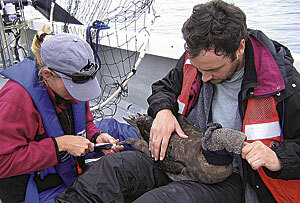 Michele Hester (Oikonos) and David Hyrenbach (Duke University) banding a black-footed albatross. For centuries, the world's largest seabird, the albatross, has been woven into the fabric of maritime lore. Its giant wings enable the albatross to stay aloft on nearly imperceptible winds, thus making it the harbinger of good sailing to mariners. Unfortunately, seamen have not returned the goodwill in kind. Each year, thousands of albatross die at the end of fishing hooks. Since the long-term monitoring studies at breeding colonies began in the 1960s and 1970s, some albatross species have decreased by 90 percent, with annual declines of up to 7 percent. The global conservation status of albatross continues to worsen, with two species listed as "critically endangered," seven considered "endangered," and ten regarded as "vulnerable," according to the International Union for the Conservation of Nature. Of the three North Pacific albatross species, the black-footed and the Laysan were recently upgraded to "endangered" and "vulnerable," respectively. The third species, the short-tailed albatross, was down-listed to "vulnerable." Because of the worsening status of North Pacific albatross populations, the National Fish and Wildlife Foundation provided funding for a study on the postbreeding movements of the black-footed albatross. This species is facing a projected population decline of 60 percent over the next three generations (56 years) and remains susceptible to bycatch in domestic and foreign longline fisheries across the North Pacific Ocean. Longlines are single-stranded fishing lines, up to 40 miles in length, equipped with hundredsand sometimes thousandsof baited hooks. The birds are attracted to the bait, get hooked, then are dragged under the water and drowned. Since 2002, pelagic long-lining on the U.S. Pacific coast has been banned in areas designated as the Exclusive Economic Zone (EEZ), which extends 200 miles offshore. But albatross remain threatened because they travel well beyond the safe zone into unregulated waters. Demersal long-lining still occurs off the Pacific coast of the United States and in the Aleutian and Bering Sea continental slope. Tracks of four male (yellow) and five female (red) black-footed albatross followed for a total of 392.5 tracking days during the summer and fall of 2004. Black lines indicate the extent of the U.S. Exclusive Economic Zone. This threat of loss to albatross populations has made these birds a priority for conservation action. Scientists are using GIS to gather information about albatross movements to identify those fisheries and nations with conservation responsibilities for these far-ranging seabirds. This information will improve the bird's chances for survival by focusing international management actions toward important foraging areas and potential fishery threats. GIS may be the harbinger of good fortune for troubled albatross populations. Although large population declines have been projected, very little is known about the movements and threats faced by individual albatross at sea, especially during their postbreeding dispersal. Oikonos Ecosystem Knowledge is a nonprofit organization that is applying its GIS program to investigate how albatross habitats and longline fisheries are distributed spatially and temporally. Esri provided Oikonos with a grant for GIS software, which is enabling the organization to map large-scale regions of the North Pacific Ocean and overlay point and polyline data with EEZ and U.S. National Marine Sanctuary polygon shapefiles to calculate the amount of time spent by bird species in specified regions. Oikonos and collaborators (Duke University, the Claremont Colleges, and the U.S. Geological Survey�Moss Landing Marine Laboratories) submitted findings to the National Fish and Wildlife Foundation as part of the foundation's albatross study. 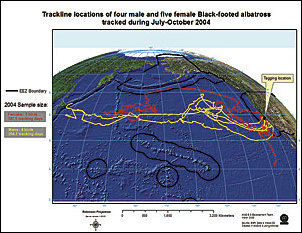 Tracks of five male (yellow) and four female (red) black-footed albatross followed for a total of 355.1 tracking days during the summer and fall of 2005. During 2004�2005, the project team of scientists used Kiwisat Argos-linked transmitters to track the postbreeding movements of 18 black-footed albatross tagged in California's Cordell Bank National Marine Sanctuary. Albatross are known for flying long distances, and the study confirmed these incredible journeys. The duration of the birds' tracking sessions ranged from 22 days to an amazing 57 days. One bird traveled as far as Hokkaido, Japan, a linear distance of more than 7,300 kilometers from the tagging site. Overall, four out of nine males traveled west of the international dateline (180� W) yet only one of the nine tracked females ventured into the western North Pacific. This preliminary data suggests that male and female birds segregate at sea. This is an exciting possibility with important conservation implications. Oikonos used ArcGIS Desktop (ArcInfo) to evaluate spatial distributions of albatross telemetry locations throughout the North Pacific and performed a spatial analysis of mapped points, polylines, and polygon shapefiles. It evaluated differences in distribution between male and female albatross by comparing the extent of their foraging ranges, though this comparison showed no significant gender-based differences in the maximum distances traveled. Using the satellite-tagged birds and remotely sensed information from satellites, scientists are currently investigating and quantifying bird movements in association with sea surface temperature, chlorophyll concentration, and wind speed and direction. GIS analysis is also being used to identify those nations with responsibility for the conservation of this far-ranging species throughout the bird's life cycle. Using GIS, scientists are assessing the albatross distributions relative to management zones and protected regions. Findings to date showed that postbreeding black-footed albatross do not remain within the Cordell Bank National Marine Sanctuary or the U.S. EEZ waters but range widely across high seas areas harvested by pelagic longline fisheries. Currently, based on the known breeding colonies, Japan and the United States have jurisdiction over the black-footed albatross. During the postbreeding season, however, the birds tracked during this study ranged within territorial waters of Canada, Japan, Mexico, and Russia. These impressive movement patterns represent a great challenge for albatross conservation, since fisheries management in the high seas is hampered by the lack of standardized bycatch data collection and enforcement mechanisms across fishing fleets. By overlapping albatross satellite telemetry tracks with boundaries of jurisdictional waters and fishing effort data, ArcGIS graphically highlights those fisheries and countries with responsibilities for albatross conservation. 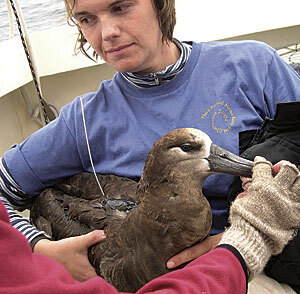 Black-footed albatross ready for release by biologist Sue Abbott. Results from this study have been provided to the black-footed albatross status assessment, currently under way by the U.S. Fish and Wildlife Service, and will be made available to BirdLife International's global procellariiform tracking database. This multinational database has been used to identify important seabird foraging grounds and migration corridors in the southern ocean and will provide a conceptual foundation for future important bird area delineation in the North Pacific. Conservation of far-ranging albatross species requires accurate knowledge of their movement and distribution at sea. This study is the first of its kind to track the incredible postbreeding movement and habitats of the black-footed albatross across the North Pacific. Increasingly, the integration of satellite tracking, remote sensing, and GIS mapping is empowering resource managers to tackle large-scale conservation questions. For more information, contact David Hyrenbach (e-mail: khyrenba@duke.edu), Cheryl Baduini (e-mail: cbaduini@jsd.claremont.edu), Michelle Hester (e-mail: michelle@oikonos.org), Carol Keiper (e-mail: carol@oikonos.org), Hannah Nevins (e-mail: Hannah@oikonos.org), or Josh Adams (e-mail: josh_adams@usgs.gov).